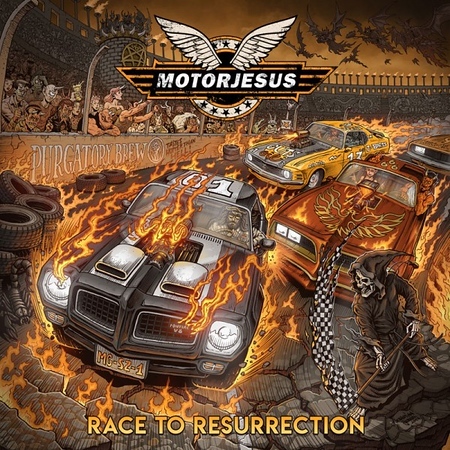 “Race to Resurrection” is the latest album from German rockers Motorjesus and it was released on 15th June via Drakkar Entertainment. The hard rock outfit trace their roots back to 1992 when they formed as The Shitheadz, before changing their name in 2006. Since then they’d released three albums and a six track EP, prior to this latest offering. I included the track “The Damage” on the Friday NI Rocks Show on 15th June and “King Collider” on the Show on 29th June. The Shitheadz formed in 1992 and issued a few demos before their only album “Dirty Pounding Gasoline” was released in 2004. Censorship issues led to the name of the band being changed to Motorjesus in 2006 ahead of the release of the album “Deathrider”. That was followed by the EP “100,000 Volt Survivor” in 2009 and the albums “Wheel of Purgatory” (2010) and Electric Revelation (2014). There were a couple of departures from the band following the release of “Wheels of Purgatory”. The three that remained were Andy Peters on guitar and Oliver Beck on drums, along with Chris ‘Howling’ Birx on vocals. There hasn’t been any announcement of longer term appointments to the vacant bass and guitar spots.